As October draws to an end I wanted to take the time to share thanks for multiple individuals, groups, companies etc that have been fundraising for me recently! there is a few events upcoming soon and other that have recently passed, all I am hugely grateful for! my first huge thank you is for Lizzi Floyd at the beginning of October Lizzi did something so amazing to raise money for the dream fund. Lizzi has chronic illness herself and can relate to the constant battle health implications can cause. To help myself and my family she cut her super long hair off and all the sponsor money was donated to the fund as well as her hair being donated to a separate charity also! I am so so grateful that anyone would do something so brave for me- Lizzi you are a star, and such an incredible friend- thank you from the bottom of my heart, I'm eternally grateful! Here is the before and after pictures of Lizzi's brave hair cut- doesn't she look amazing! Before and After- Lizzi's first hair cut by a hairdresser in six years! Another huge thank you is for Concensus Opera for their performance of Oscar Wilde's 'The Importance of Being Ernest' held at the town hall yesterday evening and again tonight! The production has kindly been in aid of Chloe dream and I have heard wonderful things about the performance already! A big thank you to Tim and Claire Johnson as well as all the cast members and all involved in ensuring the production is a huge success and I am told it has been many times in the past! My sincere apologies for being unable to attend myself, but I do look forward to meeting you all in the near future to share my thanks in person! This Sunday from 7.30pm onwards! A huge thanks to Jessica + George Morris and Luke Sumners for putting so much hard work into this event- you have been so kind and I appreciate all the organisation you have done to make the evening awesome! I'm well aware that many others have put a lot of time and effort into the event and I can't wait to meet you all and thank you in person! A huge thanks to all the support I have been shown on the event Facebook page also, it's so amazing to know I have the support of so many people! I promise to continue my thank you list very soon! There is so many people that deserve more than words as recognition for all the effort put into helping me and when the adaptions are done I really do hope I can advocate for others from what I have learnt throughout the process and give back in the way people have so kindly given to me! Take care, with loads of love! I can't believe how quickly this year seems to be passing by. Although I find the days can drag at times, the months have certainly flown by and I cannot believe we are already coming up to September. Over the last few months there has been lots of amazing support locally for myself and my family and we send a huge thank you to everyone that has been involved in fundraising and donations. I am going to do a separate update on the housing adaptations and what stage that is at, as I have lots to share in this post already and you may get a little bored of reading all my ramblings in one go! I am eternally grateful for every single donation I receive towards 'Chloe's Dream'. The time people also invest into helping us is equally appreciated. I often receive messages from people saying things along the lines of "I am sorry it isn't much" or "I am sorry I cannot give more" and I just wanted to say, no matter how big or small a donation is, I am so thankful. I completely understand that money does not grow on trees (wouldn't that be amazing!) and that life is expensive. Just the fact alone that someone makes the choice to help us is incredibly humbling and makes me extremely thankful. The saying "Look after the pennies and the pounds will look after themselves" springs to mind and I have seen first hand how small donations all add up into something amazing. A big thank you to Kerry Brown for organising the women's afternoon at Wickhamford Sports Club. Thank you to everyone that came and showed support for St Richards Hospice and myself as well as those that organised stalls at the event. This event was made even more special with the surprise visit from my best friend Rachel who travelled up to the event to support us! Another huge thanks goes to Lorraine Mansfield and family for the generous donations and support from Sarah's Well. We are so grateful for the kindness you have shown from your family to ours and I hope that I can continue doing work in the community with Disability and Complex Chronic illness awareness that would have made Sarah proud. 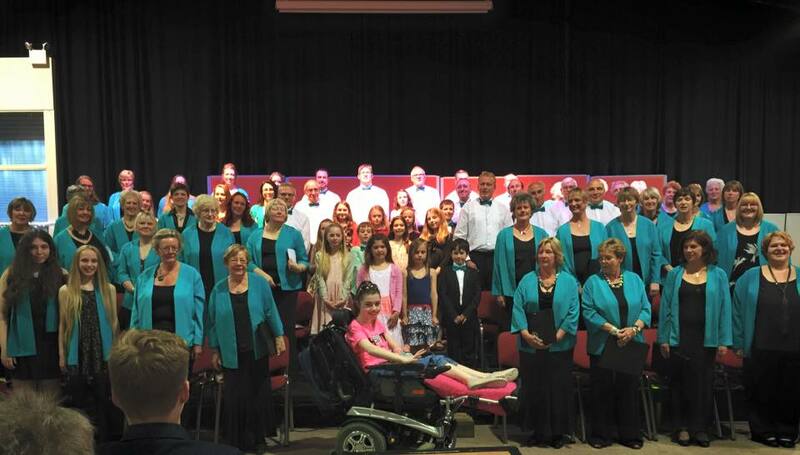 Bidford Area Community Choir, the incredible concert you held to raise money for us showed me what a lovely community we are a part of. The concert was fantastic and the amount of people that came made me realise that we are part of such a great village community that supports local individuals in times of need. Thank you! A great big thank you goes to Pauline Roberts and the Newbold Scouts 5th Rugby for their kind donations to our project. I am really impressed by you all for showing such kindness and empathy with your donations and look forward to coming to meet you all when I am well enough! Last but by no means least, Thank you to Sarah Grubb for kindly nominating us to be part of the Warner's Budgens Community Savings Scheme. Until 31st January 2016 one of the large donation boxes within the Budgens store is allocated to 'Chloe's Dream' and any donations made during this time will be presented to us as a family. I would also like to share thanks with: Merryn and Clare Crofts, Miranda Williams and family, Wayne Weatherhead (on behalf of late Charlotte Weatherhead), Mike and Val Prickett, Staff at NFU mutual Woodland IT department, Shelley Robinson and everyone else who has fund raised for us within work, groups, churches and more to raise these vital funds over the last year. I am aware there is many other people that have helped us to raise funds, and everyone is equally appreciated! Over the last few months I have also had some great chances to raise awareness for the complex health conditions I have both online and in newspapers. I would like to say a big thank you to Laura Kearns for her dedication to ensuring 'Chloe's Dream' was publicised locally and keeping up with local events in the Stratford observer. Those articles can be found here and here. A big thank you to Caters news agency for their time and dedication to ensuring my story was accurately publicised nationally. Speacial thanks to Laura Hartley for embarking on the challenge of understanding my medical condition and writing about it so clearly. Thanks to Mike also for having such patience when taking photographs for the article and making me feel at ease, as well as driving over to our home from Birmingham to do the photo shoot! Links to the articles can be found by clicking the images below. 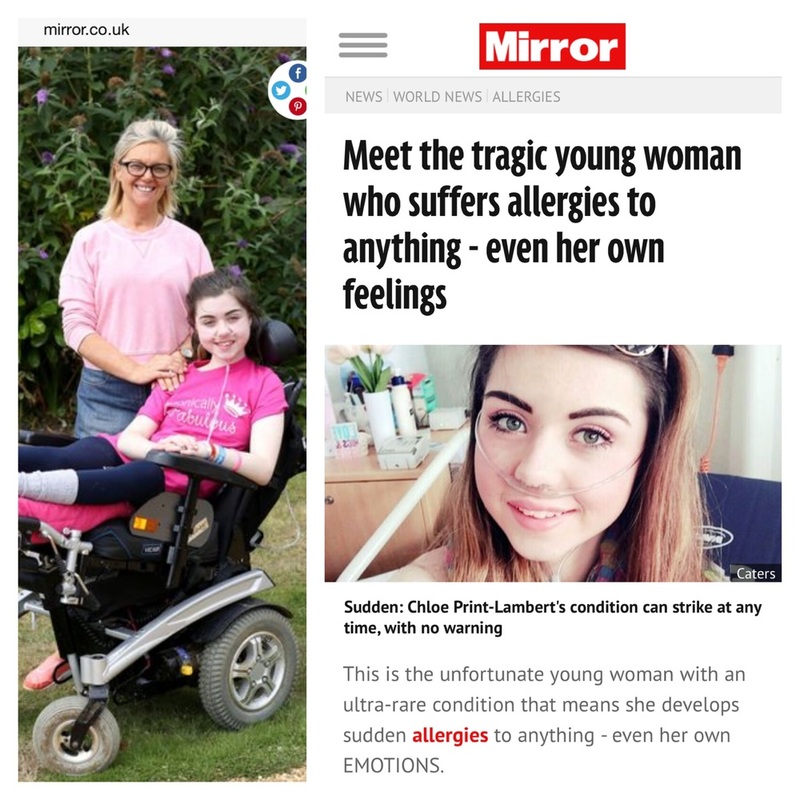 As well as Newspaper articles I was also privileged with the opportunity to write an article for 'The Mighty', a fantastic media company for articles written on topics involved with Disability, Chronic physical illness and Mental illness. I look forward to writing another article very soon, once my mind allows me to focus! To read my article please follow the link below. The final project I completed recently was for HANs Awareness week 2015, A week dedicated to raising awareness of home artificial nutrition. The week ran from 10th-16th August and during this time I created and published a video on social media to highlight Home Parenteral Nutrition, a form of artificial nutrition that totally bypasses the digestive system for people with severe digestive tract conditions such as Intestinal Pseudo obstructions, Crohns Disease, Gastroparesis, Mast Cell Activation Disorders/Mastocytosis, Short bowel syndrome and Intestinal failure to name just a few. I was also involved in a fantastic awareness video created by PINNT, a fantastic charity that supports people receiving artificial nutrition. Click here to view the video! Whilst I would love to share with you all a few other projects I am working on currently, I must keep these under wraps a little longer to ensure everything runs smoothly! Although my energy levels are very limited, the energy I do have I try to use constructively to create positive change for those with similar situations to my own and reach out to vulnerable young people using my own experiences to make a difference. It makes getting up and fighting each day so worth the battle and the thanks I receive from people both locally and further afield makes every moment of blood, sweat and tears (literally on many occasions!) totally worthwhile. During the next week I will do my best to update in more detail on my how my health is currently and will also explain the point we have reached in regards to the housing adaptations that are so desperately needed. I created this video to give an insight into what it is like to live with multiple chronic illnesses. The video speaks from my heart, and I hope it can show people that sometimes we can be strong outwardly, but dealing with difficult feelings. If you know someone who is chronically unwell or disabled, reach out to them- you could be making a huge difference to the day just by saying "how are you?". I am so grateful for the support I receive from the local community and would love to see you there!